This image is a visual-prediction-compilation of metropolises within the Los Angeles metropolitan area. From the top to the bottom it is digitally compiled in rows reading from Downtown through Mid Wilshire, West Hollywood, Westwood, Santa Monica and it’s promenade and finally the Venice Beach Boardwalk at the lowest area. Imagine if you will that 10,000 years ago the greater Los Angeles area was a mere open swamp. 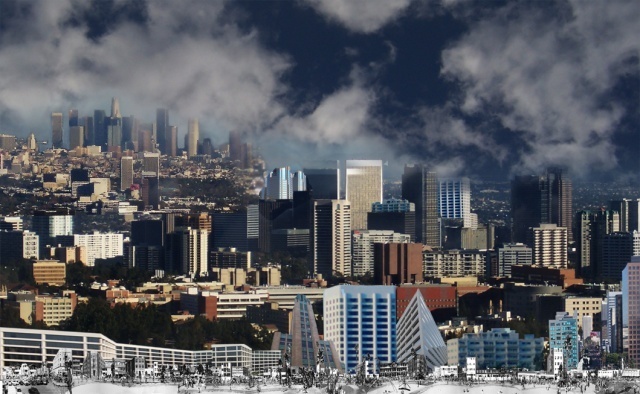 If commercial high-rise development proceeds at the rapid rate it has been evolving for the last fifty years, the current Los Angeles metropolitan areas will fill in its domestic land space and leave LA no choice but to become a massive Megalopolis. Until then it remains now as a collection of Metropolises. The progressive ocean water levels that are rising due to the predictable global warming that is melting the frozen North and South poles that could perceivable re-flood this basin within another fifty years created by a blindly overseen and ambiguously unprepared natural disaster leaving Los Angeles in an open swamp once again. What goes around might come around! In time, there may be no civic land to roam on?